Chamonix is renowned for its intrepid skiing but also due to it being such a large resort caters for beginners & intermediates. 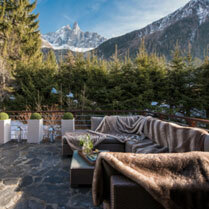 We offer a collection of luxury chalets throughout Chamonix, catering for all sorts of holidays. We have a selection of luxury chalets in the lovely Argentiere area, Chalet Baby Bear being one of our favourites. Catered or self catered, hot tub or swimming pool, gym take your pick from our luxurious collection.